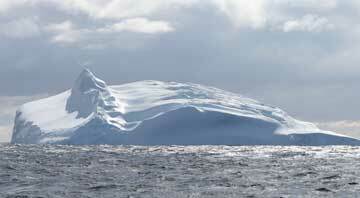 Floating icebergs, such as this one, may enhance marine life. New research shows that concentrations of phytoplankton, krill and seabirds are higher near icebergs. Creatures living in the cold, rough waters of the Southern Ocean around Antarctica may be getting a little boost from icebergs. Researchers recently found that concentrations of marine life are higher in the water around some icebergs than in water farther away. As icebergs melt, researchers suggest, terrestrial material embedded in the ice is released, fertilizing the water with nutrients important to the ocean’s inhabitants. The idea that icebergs may help stimulate the life around them is not new, says Ken Smith, an oceanographer at the Monterey Bay Aquarium Research Institute in Moss Landing, Calif., who led the new research. As glaciers glide over land, all kinds of terrestrial debris get stuck in the ice. When an iceberg breaks free, it takes some of this material with it, depositing the debris into the ocean as it melts. But no one has formally studied how this might affect marine life. “The data have been anecdotal,” Smith says. Smith and his colleagues investigated the question by looking at two icebergs in the Weddell Sea off of Antarctica. The team studied a smaller iceberg with a surface area roughly the size of 24 football fields, and a larger iceberg that was nearly the size of the island of Malta at the beginning of the study before shrinking down to an area just one tenth that size after being grounded on an island. The researchers looked at a variety of organisms around the icebergs. First, they found that levels of chlorophyll in the water, which they used as a proxy for phytoplankton biomass, were higher within one kilometer of the icebergs than levels in the open ocean. They also found that krill were more abundant up to nearly four kilometers from the icebergs, and seabirds were more abundant up to nearly a kilometer from the icebergs. These populations probably thrive near icebergs due to trace elements in the terrestrial material shed from the iceberg, Smith and his colleagues concluded in the June 22 Science. Added iron, for example, stimulates phytoplankton growth. This increased production has a domino effect, stimulating the growth of other populations of organisms higher up on the food chain, such as krill and seabirds. Smith and his team found evidence of terrestrial material in the water surrounding the icebergs, but did not measure iron directly. “A nice challenge for future research would be to do more systematic sampling of dissolved iron around an iceberg,” says Hein de Baar, an oceanographer at the Royal Netherlands Institute for Sea Research in Den Burg. Smith says that he plans to do this during a larger upcoming expedition where his team will look at more icebergs of varying sizes. Kevin Arrigo, a biological oceanographer at Stanford University in Palo Alto, Calif., says that he is glad that someone has finally made formal observations of increased life around icebergs. “It’s kind of neat that someone actually demonstrated it,” he says. Arrigo points out, however, that Smith’s team studied icebergs in an unusual part of the Southern Ocean: The Weddell Sea is full of icebergs, but other parts of the Southern Ocean have a lot fewer, so organisms in some parts of the Antarctic may not have the opportunity to experience the stimulating effects of icebergs. Arrigo has studied icebergs in the Ross Sea — the only other area in the Southern Ocean with a high concentration of icebergs. He has looked at icebergs that are much bigger than Smith’s — some the size of Connecticut — and has not detected the same life-enhancing effects around them. He suspects something different must be going on with these larger icebergs. Exactly what would cause productivity differences between smaller and larger icebergs, if that indeed is a trend and not just an anomaly from this limited study, is unknown. Studying differences between the icebergs from the Weddell Sea and the Ross Sea would make for a “neat comparison,” Arrigo says, and a good subject for further study.